The duration between each frame is 0.1 seconds. Linda McKenzie's time for this event was 4:04.73, an Australian and Commonwealth record. The swimmer in the background is Kylie Palmer. Frame #1: The left arm is applying propulsive force from in front of the swimmer. The head looks forward producing a large frontal area that creates unnecessary resistance. The swimmer's body alignment features hyperextension of the upper back and neck but from the waist down to the feet streamline is achieved. While this might seem to be a "minor" feature, in a distance race this inefficient position and its negative effects on forward progression accumulate to a significant degree. Frame #2: The right arm has entered and the left leg kicks to counterbalance the vertical forces created by its movement as well as the continued lifting of the head. The left arm continues propulsion directly backward. The turbulence on top of the left lower-leg and foot clearly shows that no propulsion is created by this swimmer's kick. At this stage, it creates mostly vertical forces. The high head and hyperextended upper back creates considerable drag which is evidenced by the milky turbulence that extends from the back of the head down to the lower legs. The turbulence off the head is marked by a concentrated disturbance (the milky water is more stark than other aspects of the disturbance following the swimmer). This lack of streamline is remarkable for a swimmer of this level of experience and performance. Frame #3: The left arm continues direct propulsion. As the upper arm nears the end of adduction, the forearm and hand remain almost vertical [the slight angle could also produce a minor vertical force component that would serve to support the high head position in the breathing movement]. The entered right arm presses down and creates resistance along its upper surface. The left leg kick is completed and in the position exhibited here retards the swimmer's progress. Frame #4: Only the left hand remains in the water as the left-arm stroke is completed. It would provide negligible propulsive force in its exhibited position. The extent of the backward push appears to be less than optimal, that is, the swimmer should be encouraged to push longer in the back half of the stroke before exiting. The right arm is extended and presses down, probably to support the turned head. If the breathing action was correct, inhalation would be completed at this stage [the breathe-outside-the-effort-phase principle requires inhalation to occur in the time between the elbow exiting and the hand exiting – it would be followed by an immediate and fast return to focus the swimmer's face profile parallel to the pool bottom]. The inhalation position shows the head being held up rather than being down with the mouth positioned below the water level but in the bow-wave trough. The right leg is kicking. Frame #5: The right arm continues to press down. The turbulent stream off the back of the right arm appears to break off at an angle, which is produced by the resultant of the vertical force created by the arm and the horizontal force created by the swimmer's momentum. The right leg kicks to counterbalance the recovering left arm. The face begins to re-enter the water after inhalation, but the face profile is forward rather than being completely to the side [the swimmer could be looking for the wall, which would excuse this action]. Frame #6: The right arm continues to press down while extended forward. It is now more than one-fifth of a second since any propulsive force was created, resulting in the swimmer slowing considerably. Inertial lags of that duration are energy sapping and limit the best time that a swimmer could theoretically achieve. The turbulence off the swimmer's upper surface seems to be remarkable and excessive. The head is still oriented toward the wall [it will be assumed that is because the swimmer is sighting the wall preparatory to turning]. Frame #7: The right arm begins to change from a vertical press to a horizontal propulsive position. That marks the end of the excessive inertial lag in propulsion. The left leg kicks. Frame #8: The right arm bends at the elbow and abduction of the upper arm begins to "power" the propulsive stroke. [It should be realized that because of the angle of viewing, the usually desirable elbow-up position of a crawl-stroke arm cannot be seen. It is assumed that it occurs.] The right leg knee drops preparatory to kicking in order to counterbalance the recovering left arm, which is close to entering. Frame #9: The right arm continues propulsion and the left arm has entered. The right leg kick is partly completed. 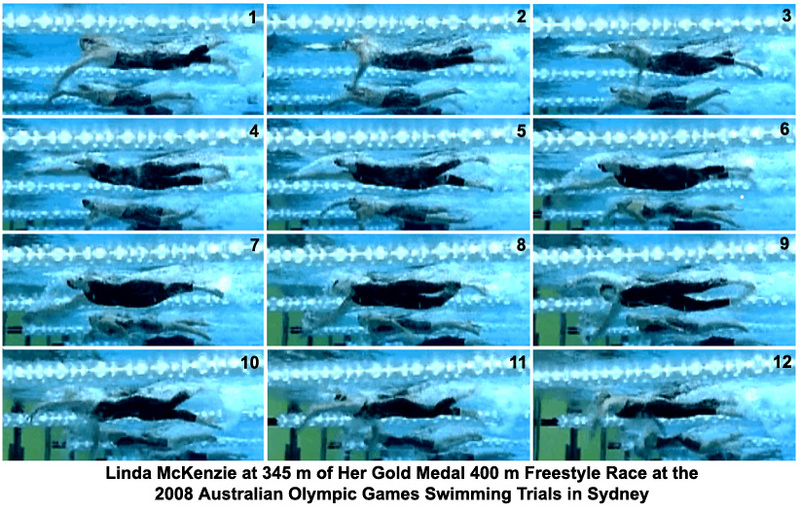 Frames #10 through #12: The swimmer approaches the wall and accelerates the timing of the left arm pull so that both arms are propelling (Frames #11 and #12). The breathing action in the early stage of this sequence leaves much to be desired. It involves unnecessary lifting of the head, an absence of rotation about the horizontal axis, and the execution of movements of body limbs to counterbalance the vertical forces it creates. A change in this swimmer's breathing action would reduce energy costs and resistances that currently are evidenced. The inertial lag (the period where no propulsive forces are created) is excessive being ~0.3 seconds. It is possible that the delay is caused by late breathing. Earlier inhalation and head return could reduce the amount of time taken and extent of depth achieved with the right arm after entry. Changes to this swimmer's technique should produce marked and considerable performance improvements.